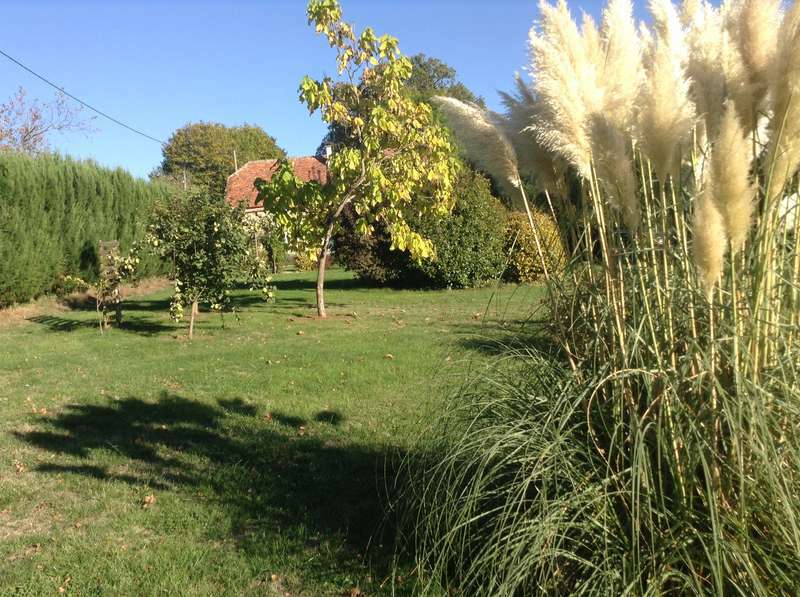 Hi, we are an English / Dutch couple who live the Dordogne River valley in Lot, SW France. We live in a converted barn with extensive grounds, which take up most of our time, needing ongoing maintenance. 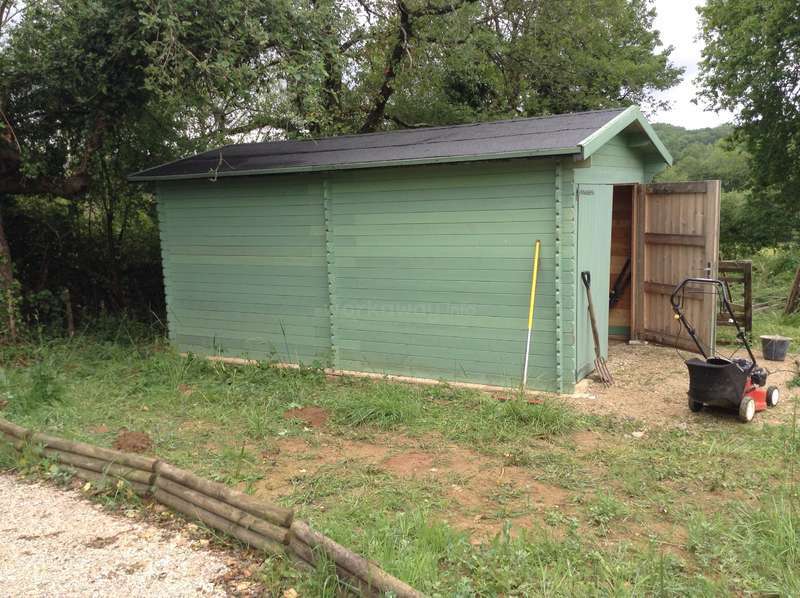 We have bought another property nearby and it is here we need to enlist your help for most of your stay! We are friendly, and pretty easy to get along with we are told. We are looking for enthusiastic workawayers to help us get the property shipshape and to help us with some projects. So if you are looking for a stay in this delightful area, then this might be it!! We have gardening, rubble clearance hard landscaping, and general outside maintenance work as well as helping with plumbing and decoration in the house. The area in which we live is rural, with the nearest market town (bars and restaurants, plus usual amenities) being around 3kms away. One bicycle!! We are close to many of the Plus Beaux Villages de France which are historic and some medieval in origin. 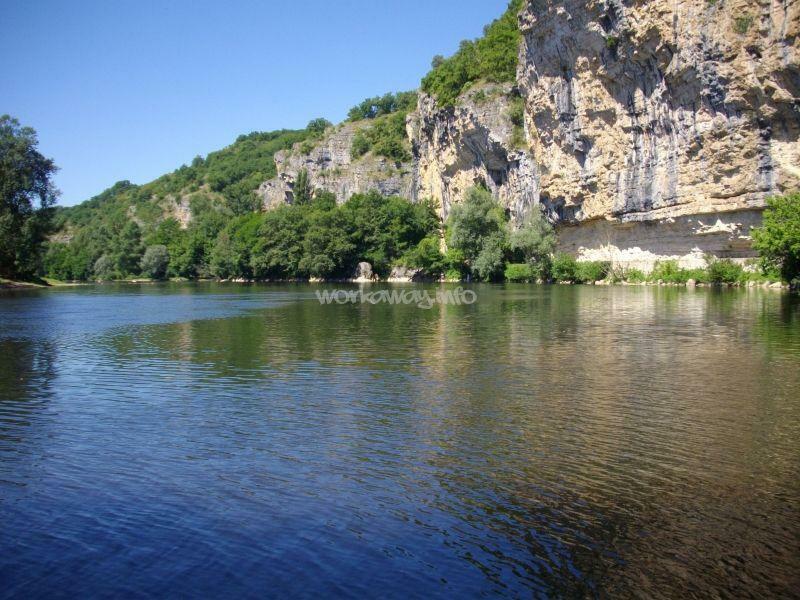 The river Dordogne is just fifteen minutes drive from here and is great for canoeing, swimming and picnicing. We will happily take you to see some of these places as they are not to be missed - or you can take the bike or your own transport!! We are in the midst of a farming community and our neighbours are friendly and welcoming for they love their countryside. We have a mixture of friends - French, English, Dutch, American, German, South African and Australian - and meals can be noisy and fun when people drop by........ ! We have lived in the UK, South Africa and now in France and will happily share our experiences with you. Although we speak English as our first language, we both have a basic grasp of French and Peter's mother tongue is Dutch. 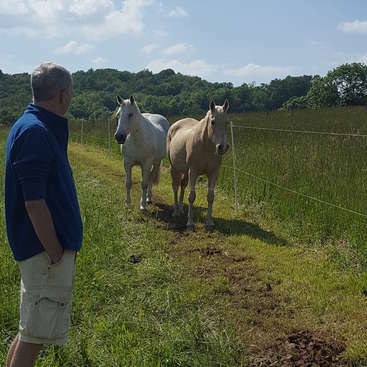 Peter was an actor and a carpenter before retiring here, where, together with Jennie, he has renovated not just the old farmhouse (which we recently sold) but also completed the conversion of the barn into our home, so we are able to share our knowledge with you. Over the course of the five years with Workaway as hosts, we have met many people of all ages and from many countries. Each has given us so much enjoyment and shared so much of their lives and different cultures. We are still in touch with most of them and some have returned for repeat visits! Volunteers who met here are still in touch with each other too - one couple are now married after meeting here. This is a beautiful part of France with much history. We hope you will share it with us. You will be part of the family so help with meals, clearing up and keeping your room clean and tidy is all part of it! You will have your room here at the converted barn with use of the living room, kitchen etc - oh and your own shower room and loo. Or if you want to pitch a tent, there is plenty of room. Free wifi. Couple very welcome. 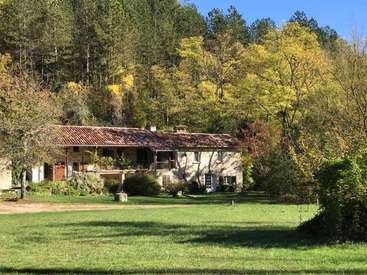 We usually take our volunteers to a couple of places of interest like Rocamadour, Turenne, Collonges La Rouge, the caves, to canoe on the Dorgogne in the warmer months, even to vide greniers (check those out on the internet!) and there is a bicycle that can be used if you don't fancy a walk to the nearest shops! Brive La Gaillarde and Souillac are served well with trains and buses from all over France and beyond. We are happy to collect workawayers from either town. Many previous volunteers have used BlaBla Car to get about. We stayed at Jennie and Peters place for about 5 weeks and we had a great time! We learned a lot of new skills that are useful if you want to rearrange your garden. We had plenty of spare time so we could continue exploring and proceed our project with cleaning up nature. Jennie and Peter gladly showed us different places and told us about… read more different routes in the nearby area and we had a lot of interesting conversations with them. Jennie is a great cook and we love her puddings! They took us in as family and being an easy going couple we had a lot to talk about, and they have a lot of interesting stories. Our dog Vattie was at great comfort at their place and loved every second of her time there, looking after what we where doing and sunbathing a lot! Cecilia and Christian (and Vattie) were on their first Workaway stay and certainly embraced this excellent concept with enthusiasm. When we first received their email we were a little uncertain about taking on a dog too, but their email and blog reassured us and we were not to be disappointed. Vattie is a lovely dog - quiet, obedient and… read more disciplined so let us reassure potential hosts that she is truly a well behaved dog - and we both fell a little in love with her too! Vattie's owners were great too. They both enthusiastically did their tasks - clearing trees and overgrown parts of the garden; building a dry stone wall; strimming; moving, and sometimes breaking, stones; laying a new pathway; clearing shrub borders; tidying up (some of) our workshop; and generally helping to tidy up our property. They were both proactive and often came up with different ideas. Little supervision was ever required. With Christian and Cecilia, there was never a time when the conversations flagged, and there was lots of laughter too. Their love of the countryside and values matched ours. They cooked us all Swedish meatballs one night, always helped to set and clear the table for meals - and sometimes did the washing up too. We are keen followers of their blog and wish them luck with their idea - they collected rubbish along the pathways around here every time they went out on a walk as part of that deep sense of social responsibility they both have. Good luck. C & C - Thank you both for coming to stay with us and all the very best to you both - and Vattie! Gentle by name, gentle by nature, Rhys joined an already established team to work on various mini projects. Happy to work both own his own or as part of that team, he just got on with the job in hand without prompting or supervision. He fitted in so well. We enjoyed evenings in the garden with good conversations and much laughter. It was all so… read more easy and relaxed. We both wish Rhys all the very best at Oxford and are very very happy to recommend him to anyone fortunate enough to have him join them as a workawayer. We really enjoyed our stay with Jennie and Peter! They were super nice to us, and quickly invited us into their interesting lifes. The accomodation was fantastic, and the dinners were amazing! We had a lot of informative chats, and both Peter and Jennie were very good at telling us about themselves and their lifes. We learned a lot about South… read more Africa, Britain and Netherlands and we had a nice insight in the French culture as well! We highly recommend Peter and Jennie to anyone! Both Rasmus and Frederik immediately fitted in to our way of life. We had to leave them on their own on their first full day with us and we came back to find that they had done everything exactly as we asked. Both strong and hardworking, they were enthusiastic about all their tasks from gardening to moving furniture, requiring little or no… read more direction from us. It was not all work......the weather was still warm enough for them to enjoy a swim in the pool and to relax in the garden. We enjoyed our mealtimes together and learnt more about Denmark too. We thoroughly recommend them to anyone who is looking for two people who work well together and who are good company. Of course, they will always be welcome here again! Thank you for having as. Our first time and such a lovley experience. It seemed as if we were visiting relatives and help them. There is everything for compforth staying. We are truly happy that we choosed Jennie and… read more Peter place. With warmest regards, your Estonian friends! We were so lucky to have Inara and Gunnar to stay with us. Their quiet enthusiasm for all the projects we have, plus one or two other jobs that came along, was amazing. They were keen to share their Estonian culture with us and soon became part of the family. Another couple joined us and we developed a great team. So much was achieved. It was… read more not all work! We enjoyed meals together and the conversation never dried up. Anyone lucky enough to have these two to come and workaway will have found a very special couple. THANK YOU. From the moment I saw his big happy smile I knew we were going to get along. He was travelling with a friend and they were immediately absorbed into the ongoing work and our home. Emiliano is strong, enthusiastic and learns quickly. He and another of the team finished off our wall in no time at all and both seems ed to be thriving on the… read more challenge (not a straight forward job as it is a stone wall and matching up is half the fun)! There were boring and less challenging jobs to do as well, but each was tackled with enthusiasm and good humour. We all enjoyed our meals together with chatter and discussion - and had a lovely Argentinian lasagne (yes, it exists) and a membrillo (quince) cake prepared by him. We even had a quick burst of the ukulele. We would be very happy to welcome him back here again one day. Was a pleasure to stay with Jennie and Peter and help them. The work was nice. The food was absolutely good and the room as well. I've enjoyed the time shared with them and also the room give us privacy. Their place is beautiful and the area have plenty of nice views. Their were really kind and helpful and gave us all the information and the… read more facilities to enjoy the wonderful surroundings. The took us to some Sunday markets in nearest beautiful towns. Thank you very much Jennie and Peter for everything. Take care and keep in touch. We have been meaning to write a review for Marco since he left, so, rather belatedly, we are doing so now. Marco is excellent company and quite a charmer (as our "lavender lady" friends will agree). He happily got with the tasks and did everything we asked. It was so different to the office life to which he was accustomed and we think that he… read more found it hard at first, but after a week, he was in to it all, needing little guidance. He was here on his own as we had not other workawayers at the time, and so he spent a lot of time with us which was always fun, amusing and we had some interesting discussions too! We would be happy to see him here again one day. The surrounding is very beautiful and there is plenty to do. If you are looking for a good start as a workawayer this would be it. Peter and Jennie are a lovely couple that made me feel so at home I sometimes forgot I was a workawayer. The accommodations were excellent, as well as the delectable meals. I highly recommend you stop by this delightful area and spend some time with these wonderful people. Thank you so much Peter and Jennie. I want to thank Jennie and Peter for my amazing first workaway experience. They are a very kind and interesting couple who have a lot of funny stories to tell. Working with Cliona was great and we felt at home right away. The cooking was really good and I won't forget Jennie's famous fig tatin. We also had fun outings, canoeing down the Dordogne… read more and a visit to Rocamadour. The work varied from day to day and was consistently interesting and rewarding. They live in a very beautiful part of France and I would highly recommend this to other workawayers. Thanks again Peter, Jennie, and meow meow! Anna was with us for two and a half weeks. What a lovely, bright, young lady. She entered into everything with quiet enthusiasm and never needed supervision and used her initiative . Together with Cliona, she was great in a team too. Mealtimes and out on trips, we always had a good time with Anna. We would love to welcome her back here one… read more day. I had the most amazing time staying with Jennie and Peter! It was my first workaway and I am so thankful for everything they offered us! The accommodation was brilliant, Jennies cooking was delicious and the company around the dinner table was lovely. We had so many good laughs and they both made me feel right at home straight away :) The work we… read more did was enjoyable and both Peter and jennie are really supportive and so knowledgeable! They also kindly took the time to show Anna and I around some of the picturesque area and famous landmarks. I'm truly going to miss both of them and their beautiful home (oh and of course meeow meeow whom provided endless entertainment) I highly recommend this for future workawayers! Cliona left us last week after two and a half weeks here. Amusing, bubbly and fun! She certainly entered into everything with enthusiasm, not needing supervision and with a happy smile on her face. We would have back here in a flash! Working with Anna too, prioved a great combination. We always enjoyed mealtimes with her stories and her ready… read more wit was infectious. Thank you so much for choosing us too. Thank you so much for your kind words....we were delighted that you joined us. Your work was excellent....if only you could have stayed to finish the wall. You know you are VERY welcome to return here. We thoroughly enjoyed your company and good conversation over meals. Your enthusiasm for everything is infectious and motivating. Anyone… read more offering you workaway experiences will be very lucky. On arrival, we overwhelmed by the incredible accommodation provided by Peter and Jennie, we knew that we had made a good decision to work with them; but by the end of the trip the luxury of the gite seemed a small factor when compared with the warmth, wit and care they showed us for our entire stay. Thanks so much for a great summer guys, I… read more hope to see you soon. I can't believe it has been over a month since we left Peter and Jennie's beautiful home. I stayed with them for a week while my travel partner was there for 2. We both had an amazing time and it was the perfect way to start off our European vacation. The description provided on this website is super accurate, we felt like we knew both Peter and… read more Jennie before we even arrived. 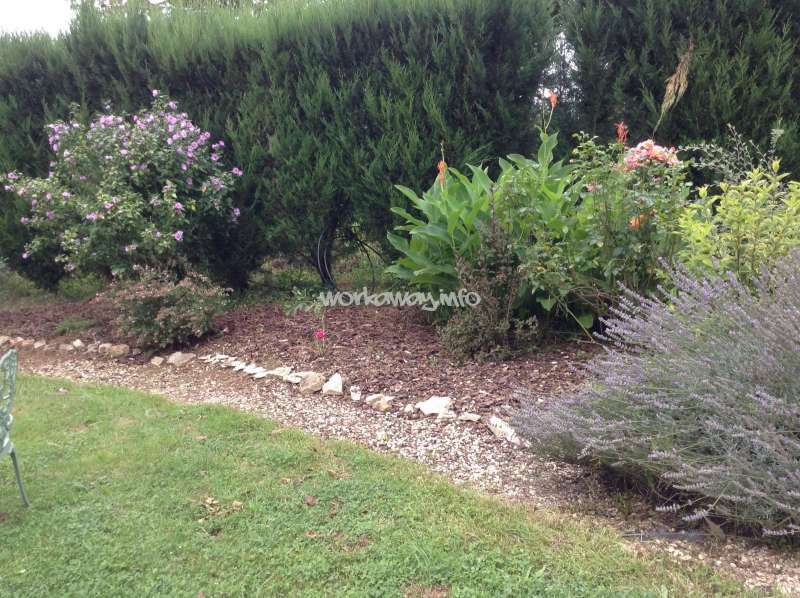 Daily work is usually weeding, garden work,helping with the pool or cleaning around inside. Peter and Jennie usually leave the afternoon free so you can travel around the village and take in any local sights, the schedule is very flexible. Jennie's cooking is also amazing, like the other reviews said and we never had to ask for anything she was so prepared and had everything ready for us in our part of the property. Staying there was so wonderful, we couldn't have asked for better company or a better experience. I hope very much that our paths all cross again! Jennie and Peter were amazing hosts! This was our first workaway experience and now I am really looking forward to doing more because of them. Although you work for them you really feel like you should be paying for your stay for all that they do and provide you, I guess it comes from their many years of experience running a Bed and Breakfast in… read more the summer! Jennie provides excellent meals which are always different and catered to my vegetarian friends. Peter... well he tries his best :P Though the bread he made was great! Their area is very beautiful and interesting as there are many picturesque French countryside villages to visit in a 4 kilometer range. They will also drive workawayers to many interesting sites like the very famous Rocamadour, Turenne, kayaking on the Dordogne River among other sites. The work is straightforward as 4 about to be university graduates had no problems though shoveling 15 tons of gravel can get tedious! Anyways I highly recommend working for Peter and Jennie, though apply soon because they will be moving to Spain in a few months if things go well! Fingers crossed! This was my first WA experience and it could not hve been any better. Jennie and Peter welcomed me right into their family. I very much enjoyed having a laugh and exchanging stories, especially over lunch and dinner (it has to be mentioned: Jennie is an amazing cook). And they even took the time to show us WAs some of the beautiful Lot / Dordogne… read more region. 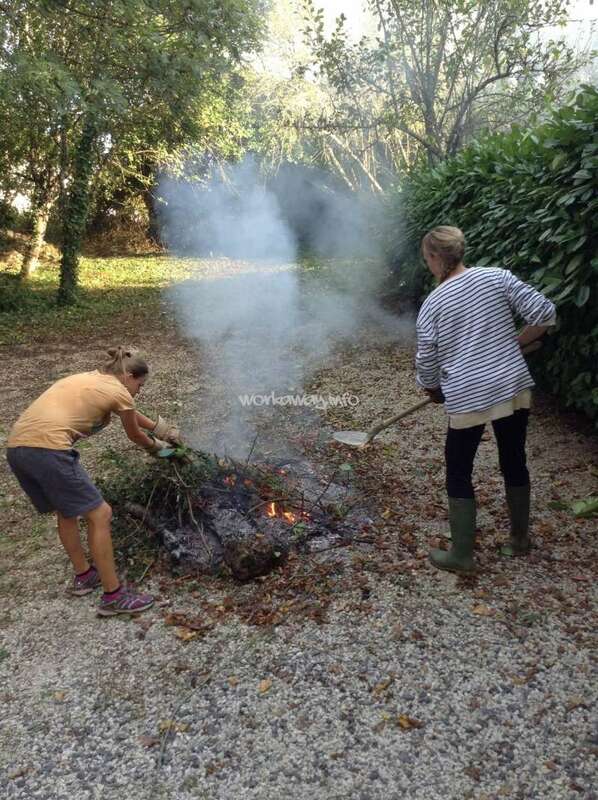 The work was pretty straight forward: weeding (pulling brambles is one of the most rewarding experiences you can have once you master the technique), spreading a few tons of gravel, painting, helping once or twice cleaning a holiday home. Since there were almost always two WAs to share the work load it was even quite a bit of fun. So to sum it up: I feel utterly spoiled and have no idea how future WA experiences will be able to live up to the example Jennie and Peter set. Thank you so much! Another excellent workawayer who fitted in from the moment she arrived. Carola turned her hand to everything with enthusiasm and good humour. 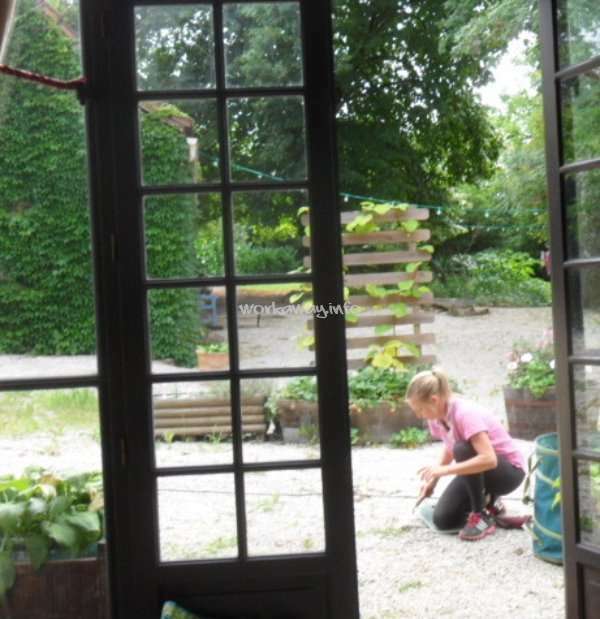 Brambles, weeds, gravel, gite cleaning, painting - she got involved with everything and we thoroughly enjoyed her company and particularly the stories of her amazing walk from Berlin to Biarritz.....coming… read more here was a rest by comparison! We were sad to see her go. All the very best to her. Thank you Carola. I had the most amazing time with Jennie and Peter, they are such lovely, warm and genuine people. The work was very rewarding in itself but it was even better knowing that you had Jennie's amazing cooking to look forward to afterwards! We often stayed much longer after meals just enjoying their company and their great stories. I highly… read more recommend visiting them if you have the opportunity, I really hope I get the chance to return one day too. They were a brilliant start to my workaway experiences and I feel very lucky to have met them. Linda is a great workawayer! We both found her to be fun, intelligent, willing and a great team player. 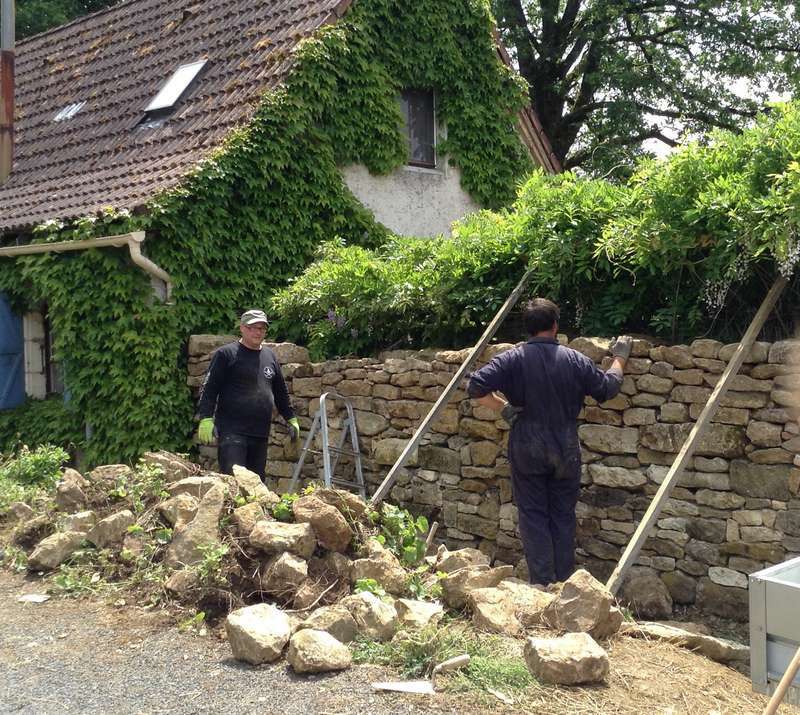 She did not baulk at any job thrown at her - moving gravel and stones, pulling out brambles, and helping clean a gite - nothing phased her and each was tackled with enthusiasm. This sounds like a school report, but all we can say is that… read more anyone offering her a workaway opportunity is very lucky. Maybe she will make a return visit to us? We hope so. Many thanks to you Linda, and enjoy your time in Europe. I spend 3,5 weeks at Jennie and Peters and it was lovely! Very nice and friendly people to stay with, good conversations, nice food, lots of laughing and they really want you to enjoy your stay and see something from the lovely area they live in. Another great workaway'r and me did a lot of work in the garden and a bit inside the house and it was really satisfying cause Jennie and Peter can't do all the work themselves anymore and are happy when the place looks nice and tidy again! We stayed in the gite next to their house where you have your own room and bathroom so you also have a place to be on your own when you feel like it. I wonder if I will ever find another workaway adres that will give the same great feeling as this one. Thank you Jennie and Peter for the lovely stay and I hope to see you again in the future! Ciska is the ideal workawayer! Her enthusiasm for everything she did was evident from the moment she arrived to the moment she left - three and a half weeks of fantastic help. She mucked in with everyone seamlessly. She is endlessly positive and fun - we laughed and laughed. Her genuine interest in what we have been, and will be, doing, plus… read more her ideas, were really great. 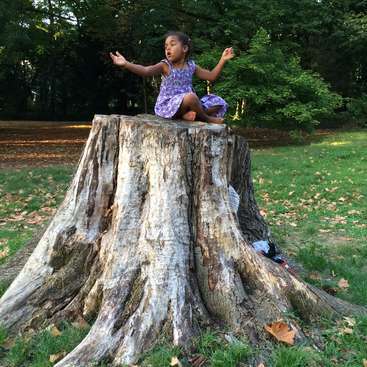 She loved this area so much so that she is spending another week exploring with a friend! Ciska - the great volunteer and, hopefully, one with whom we will remain in touch for a long time. The very best to her - and anyone offering her a place will have struck gold! Peter and Jennie were simply amazing hosts! 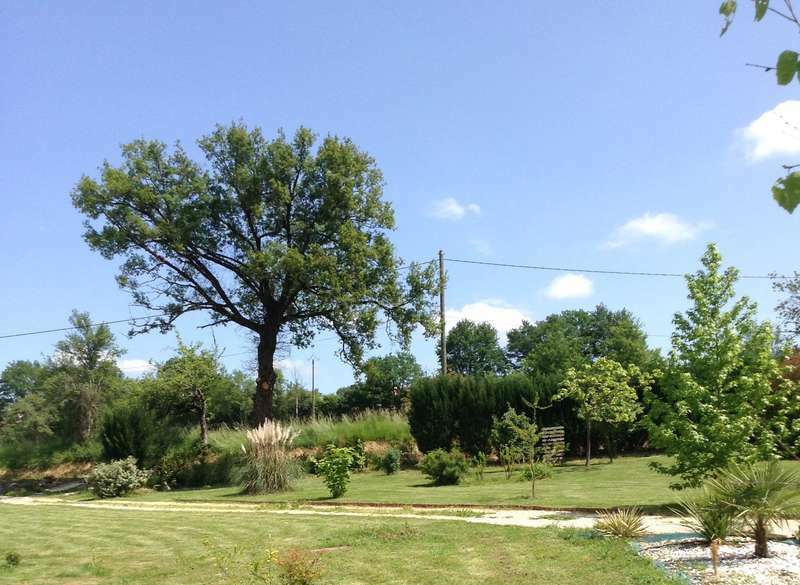 I stayed in their lovely gite with other volunteers for three weeks! The work was really enjoyable, I did a lot of gardening, pulling weeds, landscaping, and a little bit of cleaning and painting, all of which was fun and therapeutic. Jennie is the most accommodating host, relaxed and always making sure… read more we were more than well taken care of. Her cooking is simply exceptional and she went above and beyond by cooking me special vegetarian food! 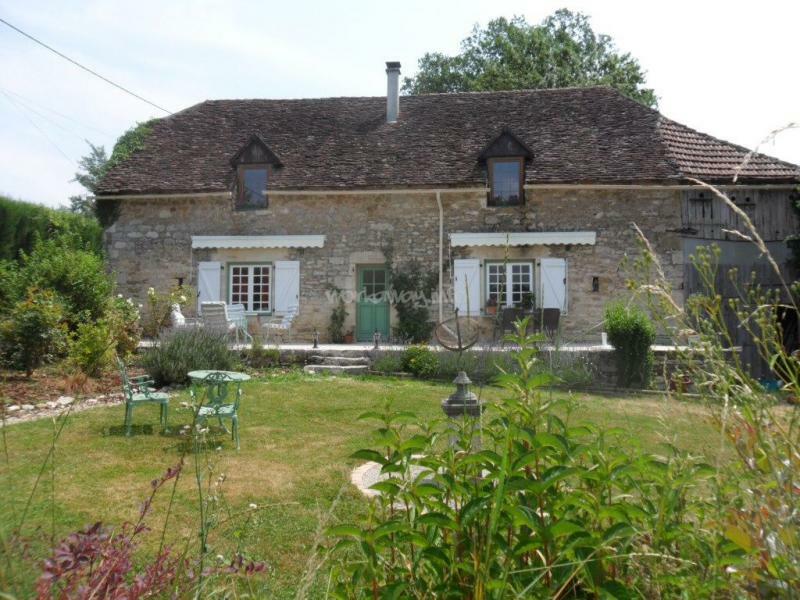 From the moment we arrived we loved Peter and Jennies lovely home and Gite! Peter and Jennie were most hospitable fun and served fantastic food at lunch and in the evening!! We undertook any job that needed doing and enjoyed our work doing all things to the best of our ability!! 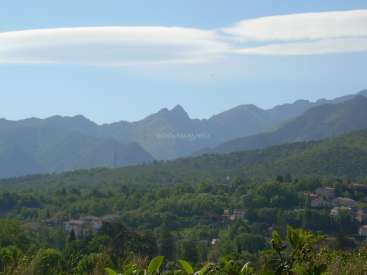 The accommodation in the Gite was great and the surroundings… read more beautiful!! I fully recommend any workawayers apply as you'll have a fun time whilst working in a great place. Amanda and Steve fitted in from the moment they arrived!!! They were enthusiastic, organised and stuck in to everything we threw at them! They were genuinely interested in what we are trying to achieve here and had some great ideas too. There were lots of smiles, laughter and jokes – and masses of hard work. We were lucky to have other… read more workawayers at the same time and the team really gelled. Amanda and Steve felt like old friends and we miss them……..so come back!! Thank you both SO much. I should have written something before. What a warm, willing and witty young lady. She was great fun and contributed to our work with enthusiasm - and with lots to say!! A delight. Jennie and Peter are very accommodating hosts who went out of their way to make sure we had fun - taking us to local touristic sites and kayaking etc while also giving us our own space (literally- in the very nice and rustic gite!). They live in a beautiful area in the countryside, have a lovely house, plenty of interesting stories to tell and… read more are glad to share their life with you. Oh and their rather cute cat. Jennie, Peter and Nick are amazing people and they all went out of their way to make us feel right at home. They are truly a fantastic family with plenty of fun stories to share at dinner time. 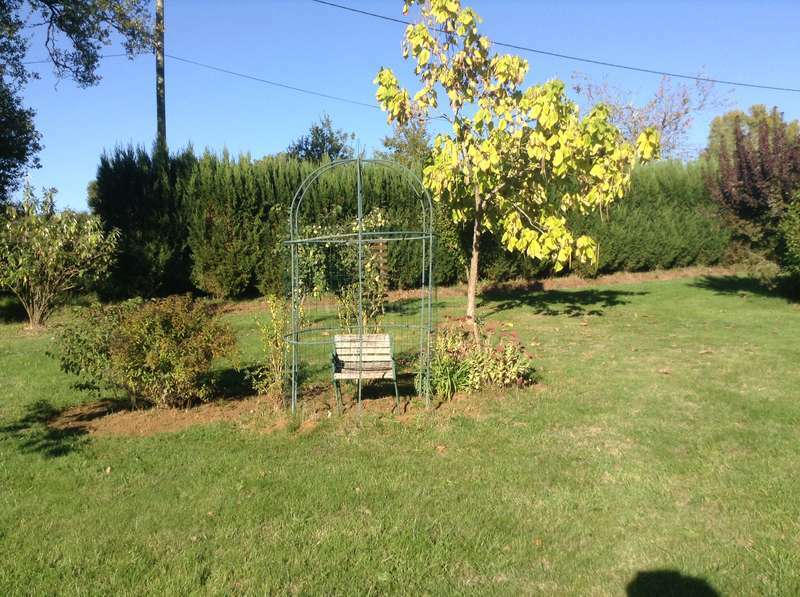 Plus, their property is lovely and the area of the Dordogne valley is absolutely stunning. Thank you so much for opening your home to all of us. Merci les… read more amis! Many thanks to you, Conor. We all enjoyed meeting you and you fitted into the group with no problem, putting up with the teasing in very good heart! Quite good really!!! Your tree pruning was excellent and weeding, whilst not your favourite task I guess, was meticulous - no sign of a return of the blighters!! The other volunteers thought you… read more were great and miss you already as do Peter, Nick and me. Have a great time in your other homeland!! Jennie and Peter gave us a great first-workaway experience! We loved learning about building and gardening in the French countryside and listening to Jenny and Peter's incredible life stories. Mealtime conversation was never dull -- they have a wealth of wisdom to offer on just about everything. Jenny was also wonderful about showing us the… read more surrounding area and letting us taste delicious local specialties. Thanks so much for the experience! We would love to come back next summer! I had a great time with jennie and peter. The work was not too difficult and they were very flexible with when I wanted to work. It was up to me when I wanted to do the work. And of course the food was amazing :) I enjoyed the sun and even the rain. Plenty to do in the area. The wall of books was definitely my favourite part. What a delight Rosie is! We thoroughly enjoyed meeting her and she was good company. She certainly was prepared to turn her hand to everything that came her way and we were sorry when she left, but hear that she is having a good time in Munich and Prague. Thank you so much, Rosie. Lee fitted in with us and every task was done well. Thank you so much!